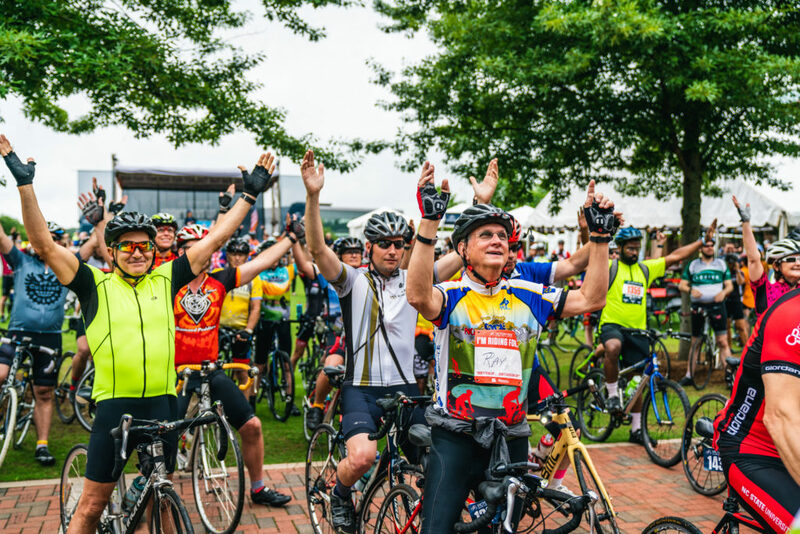 When you registered for the Victory Ride to Cure Cancer presented by Braswell Family Farms, you joined a community of passionate individuals who believe that a cancer-free world is possible. The money you and your fellow cyclists raise will help the V Foundation declare Victory Over Cancer®. 100% of rider-raised funds benefits cancer research. In order to participate in the Victory Ride, riders must meet their fundraising minimums ($250 for all distances) by Wednesday, May 15. If you have not met your minimum by May 15, you will have the option to pay the balance with a credit card if you wish to ride on May 18. *The minimum age for these rides is 15. Participants aged 15 – 17 need to be accompanied by a registered adult during the Victory Ride. On behalf of all of those fighting cancer, thank you for your commitment to defeating cancer. If you have questions about fundraising or need help getting started, we are here. There are lots of tools to inspire you in the Participant Center, and you can reach us at [email protected]. The number one reason people donate is because they were asked. Your friends and family won’t know what you are doing or how they can support you if you don’t ask! Remember, you're not asking for a gift for yourself. You are giving others an opportunity to make a difference. Start by making a list of everyone you know. Yes, we truly mean everyone. (Family, friends, colleagues, your doctor, businesses you frequent, the delivery person, etc.) You never know who might be willing to support you, and you may be surprised by the number of people touched by cancer. Share your story! Explain why cancer research is so important and how it impacts you. Address what you are doing about it. Ask your donor to take a specific action. Give your donor a chance to respond. Start with family and friends – those you know will support you. When you ask for a donation in person, it’s always important to end your ask with a question mark. Resist the urge to talk yourself out of a donation by trying to fill the silence. Follow up with an email and the link to your personal fundraising page. If they can't make a donation, or simply want to do more to help, ask them to share your link with their friends. You can do this. But don't wait until the last minute! For more fundraising tips, resources and ideas, download our Fundraising Guide. If a donation has been mailed to the V Foundation but has not been credited to your fundraising total within three weeks, please email [email protected].